Has this ever happened to you: it's a sweltering summer day, you're feeling a little tired, and you think--perhaps not for the first time--why hasn't the star of Marked for Death, Half Past Dead and Today You Die created a delicious energy drink? Well, wake up and smell the goji berries, baby, because I bring good news: he has. 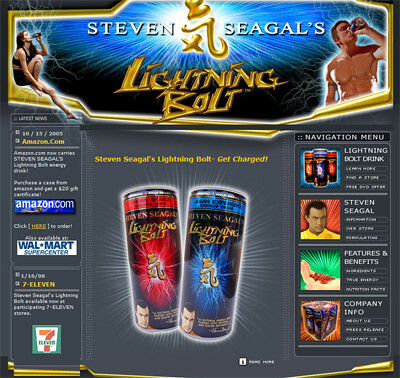 According to the website for Steven Seagal's Lightning Bolt Energy Drink, the neck-punching actor spent years traveling Asia to collect the ingredients for his all-natural beverage. Unfortunately, someone spent considerably less time creating the website. I could analyze everything that's hilariously wrong (or wrongly hilarious) about the site, but I'm a busy person. Instead, I'll just point out (and laugh at) the best parts. I invite you to laugh along. Steven Seagal now can add “Energy Drink formulator” to a list of talents that already includes veteran actor, singer/songwriter, guitarist, and Aikido black belt [...] His album, Songs from the Crystal Cave, released earlier this year, has already hit the pop charts in Europe." "...hit the pop charts in Europe." Did real well, too. (which is why 11 of his last 17 movies were self-produced and made for video). ... whose films combine spiritual concepts and social/environmental consciousness with high-voltage violence." He saves cleans up toxic waste *and* kicks a guy in the throat! Can a single item "emerge as many firsts"? What does that look like? And does it hurt? The first "first" is that the drink contains the Tibetan goji berry. Little-known fact: this is another name for the wolfberry, which is apparently a common ingredient in energy brews. Here's one, though the name is a little off-putting. But the name of this one actually means wolfberry, which should have been a bit of a giveaway. Yeah, it's always a good idea to check before making a statement like that. I did. And hey, looky! XS Gear drinks comes in three flavors, just like Stevie's brew. Zipfizz also has a trio of taste sensations. Naked Juice has kicked it up a notch (but probably not using nunchaku). My favorite is Odwalla; I'm currently celebrating the seasonal return of their Super Protein Pumpkin drink, which tastes like punkin pie and is only available through the holiday season (after which the stupid government takes it away). But I digress. Suffice it to say that a quick Goog for natural energy drink flavors throws doubt on "first-emergence" claims. The name "Steven Seagal's Lightning Bolt" was an inevitable afterthought? 1. a later or second thought; reconsideration. 2. reflection after an act; an appropriate explanation, answer, expedient, or the like, conceived of too late for the occasion. 3. something added, as a part or feature, that was not included in the original plan or design: The vestry was added to the church as an afterthought. Or, as it were, the name was hastily appended to the energy drink as an afterthought. Inevitable, really. When Steven Seagal finished creating a drink that holds untold natural power, there was only one equivalent in nature - The Steven Seagal's Lightning Bolt. Both mysterious and powerful, it's a symbol of the untold energy the earth has to offer - Such is Steven Seagals Lightning Bolt energy drink. It's mysterious! It's powerful! Its mystery is exceeded only by its power! Its name was an inevitable afterthought! Oh, and I love that the "Latest news" has been updated twice: in October 2005 and January 2006. Overdue for another announcement, aren't we? Copyeditor General's ruling: While the audience for this beverage undoubtedly expresses a preference for head-butting action and awesome pecs over careful grammar and factual accuracy, and while Steven Seagal could probably turn CGHQ into a pile of smoking rubble in seconds, websites promoting products intended for human ingestion should project a strong, consistent tone of authority and credibility. Oh, and if some big dude with a ponytail comes around asking questions, you haven't seen me. Ok this whole page made me laugh so hard, it hit me like a tai kun do chop from mr. Seagal himself.